“Bhangra” is basically a folk dance form born out of happiness, ecstacy and bliss. What could be a happier occasion for a peasant, who’s hard toil of six wintry months is going to be rewarded? Wheat is sown generally in the month of November. In Northern India and Pakistan it takes six months to ripen. But once it is ripened, the surplus can easily be sold in the market and money can be made. Wheat is the staple food in the Punjab and the other northern provinces of the Indo-Gangetic plains. Wheat also needs a lot of hard work from plantation to ripening. It needs extreme winter for several months, periodic waterings and hot weather at the time of ripening. If the weather does not cooperate during any stage of the crop, the yield can be drastically reduced. Therefore, when the wheat ripens and is on the verge of harvesting, the farmer goes ecstatic in happiness. Basically Bhangra dance is performed at the time the wheat crop is harvested. As the time has passed, Bhangra Dance has become a symbol of youth’s festivities. The birth place of Bhangra is Sialkot district in Pakistan’s Punjab province. To the North of Sialkot are the sub-mountainous areas of Jammu, which get very cold during the winters and induce cold weather in Sialkot. As I have told above, extreme cold weather is conducive to a bumper crop of wheat. To the East of Sialkot is the Ravi, which keeps the water-table close to the ground surface. Shallow water table is ideal for Persian Wheel irrigation system. To the South of Sialkot is the premier city of Punjab Lahore, which provides an ideal market for wheat. Thus Sialkot forms an ideal place for the growth of wheat. From days immemorial wheat has been the preferred crop of the Punjabi farmers. Bhangra in its crude form developed in the vacant flat areas surrounded by wheat fields. In the original format of Bhangra, the farmers were shown dancing with sickles in their hands trying to harvest wheat. One drummer “Dholi” plays the drums with a crude stick and the steps of the Bhangra dancers follow the drum beat. In the early forms of Bhangra, the exuberance was there, but the steps were rarely in unison. Some writers have suggested that Bhangra Dance is as old as Alexander the Great’s Invasion of India. But most writers seem to agree that the age of Bhangra Dance is approximately between 500 years to 300 years before the start of present millennium. The farming community of Sialkot district, some three hundred years ago, consisted of the Muslims, Sikhs and the Hindus. The majority of them were of course Muslims. As the history is told, it was the Muslim farmers, who developed the original form of Bhangra, but later on it was adopted by the Sikh farmers and the Sikhs have been in the vanguard of efforts to popularize this folk dance form. Since the days of Maharaja Ranjit Singh, although there was no official patronage for Bhangra, but this dance form spread its wings into the areas forming the districts of Sheikhupura, Gujrat, Gujjranwala, Lahore, Gurdaspur and Amritsar. During the British rule, Bhangra spread to the educational institutions in Lahore and Amritsar. The Khalsa College in Amritsar had Bhangra teams dating back to 1920s. At Government College Lahore, Bhangra was initiated even earlier. During the twentieth century, a lot of importance has been given to the costumes worn by the Bhangra Dancers. Generally very sharp and gaudy colors are chosen for the costumes of the Bhangra Dancers. These colors impart a festive touch to the costumes of the dancing groups. In 1947, the Province of Punjab was bifurcated between East (Indian) and West (Pakistani) Punjabs. Most of the Hindu and Sikh refugees from Sialkot district migrated to Ajnala tehsil of Amritsar and Batala tehsil of Gurdaspur district via Kartarpur Sahib and Dera Baba Nanak route. From these places the refugees further dispersed to other tehsils of Amritsar and Gurdaspur districts. Within a few months, the refugees from Sialkot district further moved to Bholath and Kapurthala tehsils of Kapurthala district and Dasuya tehsil of Hoshiarpur district. In Jalandhar city today about 40% of the population owes its origin to Sialkot district. All these areas during the nineteen fifties witnessed an explosion of Bhangra dance. During the nineteen fifties, Bhangra became officially acclaimed as the male folk dance of East Punjab. The most commonly performed and extremely popular female dance, of course has been “Giddha”, which has its origin in the Malwa region, cis Sutlej areas, of the Punjab State. Within the Indian State of Punjab, there was also a smaller union of territories consisting of the former princely states. The name of this state was “Patiala and East Punjab States Union” or in short PEPSU. Bhangra became the uncrowned official male dance of PEPSU too. Film “Naya Daur”, a mid fifties Chopra Production starring Dilip Kumar featured Bhangra Dance very prominently. O.P. Nayyar, a very popular music director and quite familiar with the beats of Bhangra Dance, scored the music for this movie. This film became a big box office success, not only in Punjab, but in other parts of India too. This movie gave a lot of name and fame to Bhangra Dance. Later on Manohar Deepak, a leading exponent of Bhangra Dance entered the film line of Bombay on the strength of his performance in Bhangra Dance. Mukhtar Singh, then a college student in Jalandhar, became very famous for his unique choreography for Bhangra Dance. The then Chief Minister of Punjab Sardar Partap Singh Kairon, first recruited him as a block development and Panchayat officer and later on made him a deputy director in the Punjab Department of Sports and Youth Services, where he served the cause of Bhangra Dance with distinction. Here in America, Navjot Singh, an information technologist and a resident of Morris County, New Jersey, is known to be an impressive choreographer Bhangra Dancer. During the nineteen fifties, some of the colleges in East Punjab, which excelled in Bhangra dance were the Khalsa College Amritsar, Baring Union Christian College Batala, DAV College Amritsar, Government College Gurdaspur, Randhir Government College Kapurthala, DAV College Jalandhar, Lyallpur Khalsa College Jalandhar, Ramgharhia College Phagwara, Punjab University College Hoshiarpur, Government College Ludhiana, Khalsa College Ludhiana, RSD College Ferozepore and Mahindra College Patiala to name a few. Originally basic colors like red, green, blue, white and yellow were used in the costumes of Bhangra Dancers. These are the same colors, which were earmarked by the chief architect and master planner of Chandigarh Le Corbusier for the doors and windows in his designed buildings in Punjab’s capital. But as the fashion bug has bitten India, it has impacted the mindset of Bhangra Dancers also. As a result more and more colors are showing up in the costumes of Bhangra Dancers. The Bhangra Dancers are enjoying the ever changing and never ending color combinations. During the nineteen sixties Bhangra spread its wings to Delhi University to the South of Punjab and the Jammu region to the North of the state. As the seventies dawned, Bhangra extended its popularity oversees to the United Kingdom, British Columbia in Canada and California State of the United States. During the eighties, Ontario Province of Canada became the oversees hub of Bhangra Dance. Of course, where ever Bhangra has spread “Giddha” has been its elegant and refined female companion. Both have been marching hand in hand. As the time is passing, the costumes of the “Giddha Dancers” are also getting fancier and more expensive. By now the burgeoning fashion industry of India has made deep inroads into the “Giddha Dance” groups also. The Bhangra Dancers, as mentioned above, also are not untouched by the fashion bug. On the Indian side of the Radcliffe Line, Bhangra Dance has made rapid strides and the Indian diaspora has embraced it in all sincerity. Bhangra Dance of today is no longer the rustic dance of pre-1947 days. It is getting more and more sophisticated. The movements are getting more rhythmic. Some of the choreography associated with India’s classical dances like “Kathak”, “Kathakali” “Odysee” and “Malwai Giddha” of Punjab is slowly and steadily creeping into it. The number of beats “Taals” in Bhangra Dance is also experiencing a marked diversification. Some pop music forms of Punjab are getting a nick-name “Bhangra Music”. Bhangra has become an important event during all kinds of festivities and official functions in the Indian Punjab. Even at the national level in India, Bhangra has come to be recognized as one of the prime dance forms. During the nineteen eighties and nineties, a lot of Punjabi pop songs in the United Kingdom were composed on beats resembling Bhangra Dance. The recordings of these songs became not only popular within the United Kingdom, but they proliferated also in Canada, the United States and India. Malkit Singh, formerly of Jalandhar district and now settled in the Bermingham area of England, came to be acknowledged as the Golden Star of Bhangra Music. Recently Malkit Singh has been knighted by the Queen Elizabeth II as a “Member of the British Empire”. 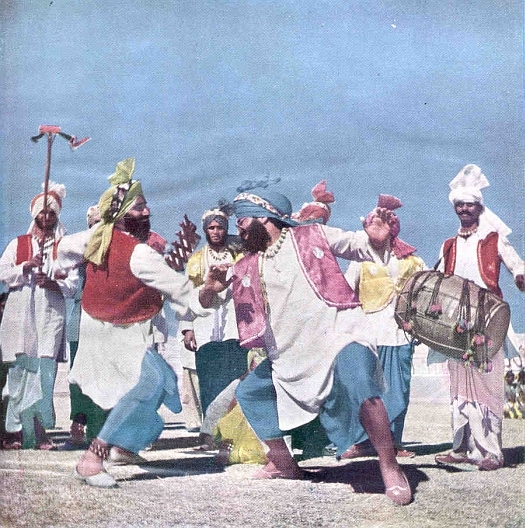 On the Pakistani side of Punjab, according to the reports reaching Amritsar, Bhangra Dance was barely surviving during the decades of the fifties and the sixties. But in the absence of some solid support from the government and from the educational and cultural institutions, this dance form appears to be on its last legs. Privately some people are still keeping it alive, in their courtyards, but it is getting extinct in public functions. If no serious efforts are made to revive this folk art form in Pakistan, the Bhangra culture of its founding country will die an enwept, unhonored and unsung death in its own place of birth. That will be a sad day for the lovers of an exuberant Punjabi art.